There were several quick-read publications in the 1930’s, 40’s and 50’s. A magazine named Quick is the most memorable for many people. But there were others. 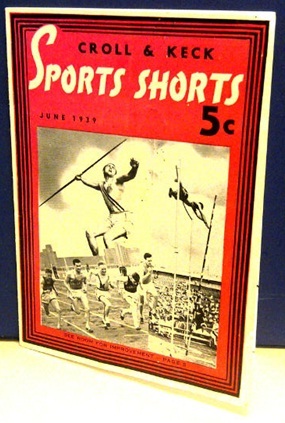 I came across a 16 page booklet called Sports Shorts, sponsored by apparel maker Croll & Keck. Published in June 1939. Stanley B. Frank, Editor. I had never seen it before. Sports Shorts opens with 6 quick blurbs. One is about how the Chicago Cubs signed a 12-year-old New York kid, Charley ‘Red’ Solomon. And how the Boston Bruins bested that by signing 5-year-old Donald Clapper. Red and Donald are not listed in the majors or minor leagues of Baseball and Hockey on sportsreference.com. Only Donald’s Dad, Dit Clapper, the 20 year Bruins veteran defenseman and Hall of Famer, is listed. Thus, some blurbs portend nothing. Then again……. There is one prescient blurb on the page. 418 is a nice number. It’s not the biggest. Matt Kilroy of 1886 Orioles had 513 strikeouts. Still, 418 is killer, and Trucks’ K/IP ratio of 1.53 is other worldly. As auspicious as Mr. Trucks’ professional beginning seemed, he did not become a Cy Young winner or a Hall of Famer. He was a very effective starter. He completed a 17 year MLB career with a 177 – 135 record, led the league in shutouts and K’s once each, was a 2x All Star, a 3.39 career ERA, giving the majority of those years to the Tigers. Trucks served 2 years in the military during WWII, rejoining the Tigers just in time to be inserted on the roster for the 1945 World Series. Trucks started 2 Series games, getting a W, and registering a 3.38 ERA, similar to his career ERA. He played for some bad Tigers teams after the ’45 World Series. Run support was frequently woeful. He was traded to the Browns and White Sox as a starter. He was signed by the A’s and the Yankees to work out of the bullpen. By the time he hung it up at age 42, he could still pitch but he just didn’t have the interest in playing any more. He was done. Done — except for one little barnstorming foray in 1960 at age 43. Trucks and his old Browns teammate, Satchel Paige, signed on to be opposing starters in a tour of Cuban All Stars. The tour started in Kansas and headed for Mexico. All went well until the promoters failed to pay Trucks and Paige, causing them to leave the team. Soon thereafter, the Castro revolution broke out and the Cubans departed for their island home, too. The ever succeeding Mr. Trucks continues to succeed today. The 95-year-old resides in Calera, Alabama with his 4th wife. He may not have won a CY, but he surely is durable. This entry was posted on June 12, 2012 at 5:43 pm	and is filed under BASEBALL, BASEBALL BOOKS. You can follow any responses to this entry through the RSS 2.0 feed. You can leave a response, or trackback from your own site.